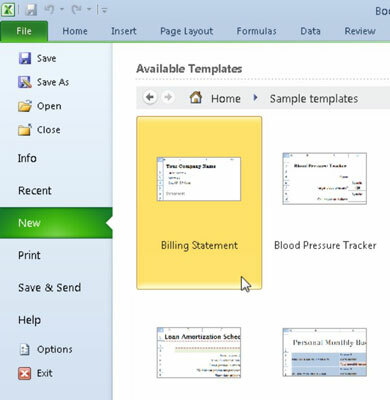 Excel 2010 provides templates, ready-made worksheets for common uses. These predesigned templates contain standard or boilerplate text, but you can modify them to fit your needs. 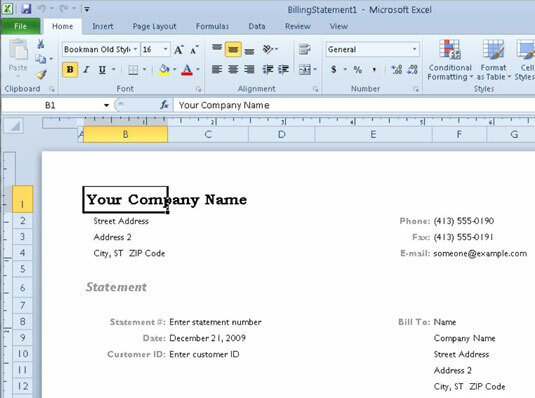 You can use the templates automatically installed with Excel 2010 or you can download free templates from Office.com, the Microsoft Office Web site. Excel templates use the .xltx filename extension, as opposed to .xlsx for an Excel workbook. The following templates are automatically installed when you start using Excel 2010: Billing Statement, Blood Pressure Tracker, Expense Report, Loan Amortization, Personal Monthly Budget, Sales Report, and Time Card. Many additional templates are available for downloading. The Available Templates panel appears in the Excel Backstage view. Click Sample Templates at the top of the Available Templates panel. The middle pane displays thumbnails for each of the installed templates. A preview of the selected thumbnail appears in a preview pane on the right. You can select an installed template to generate a new workbook. Select the desired template from the middle pane and click Create. Excel opens the selected template. A new billing statement worksheet generated from the Billing Statement template. Customize the template as needed. If you have Internet access, you can easily view and download any of the templates offered by Microsoft directly from the Backstage view in Excel. Click the category of the template you want to download under Office.com Templates. The middle pane displays thumbnails for each of the items in that category. In some cases, you may need to select a subcategory in the middle pane before you see the thumbnails. A larger preview of the selected thumbnail appears in a preview pane on the right. 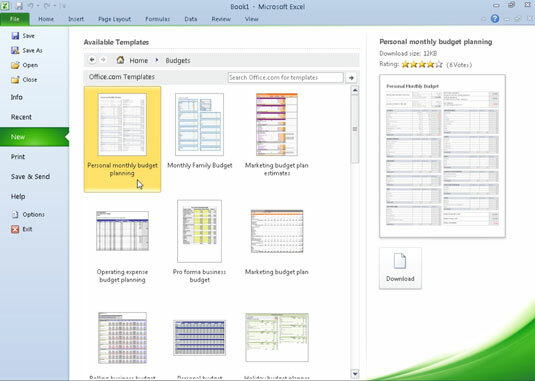 Selecting a Budget template to download from Office.com. Select the thumbnail image for the template you want to download and then click the Download button. The Download button appears under the template’s preview, on the right side of the Available Templates panel. After downloading a template from Office.com, you can use the template to generate new workbooks by opening it from the Personal Templates tab of the New dialog box (open this dialog box by clicking the My Templates button in the Available Templates panel in the Excel Backstage view).